By popular request part of the blog will list Post Office branches which have NCR Post and Go machines, as they are reported to me. Only comments which refer to this, the date that the machines went live, or content of the machines will be published on this post. All reports so far which have mentioned machine/kiosk numbers show machines are numbered 67, 68, 69 etc. Number 67 has been described as a 'master', with the others all 'slaves'. Note: as the NCR machines are being installed all over the country, with some speed, I can no longer keep the table up to date, but will continue to accept comments about new locations. Note that the Spring Blooms stamps are also appearing in NCR machines. UPDATE 1 June 2014: A new list of NCR branches, provided by Post Office Ltd, can be found here. The list has not be checked against information we already have and no start dates are shown. That list will be updated with extra information as received and all future comments may be made there. I was told several weeks ago that Truro is undergoing a refit, so that may be the first in the SW.
Muswell Hill's machines went live on Friday and broke down on Saturday, neither working today. Sydenham (London SE26), Poplar (London E14) & South Woodford (London E18) are expected to get machines this week. From talking to a rep who was training staff, and dealing with teething problems, such as the receipt printer not printing correctly, branches go live on a Monday, Wednesday & Friday in up to three locations each day. Though they are currently behind in the roll out. Walthamstow Central, Rotherham & Harborne (Birmingham B17) are also expected to have them soon, if not already. Visited Kingsland Road, Dalston today. The most helpful two ladies on hand. Excellent service. Hi STROUD went live yesterday Fri 21.03.14 there are 3 Machines in use ~ CODE is 008523. Muswell Hill went live last Friday 14th March code 013004 2 kiosks. Kiosk 67 MA12 2nds, kiosk 68 MA13 2nds, Machins MA13. Sydenham, Poplar and S Woodford all have building work progressing with S Woodford probably closest to finishing with kiosks due next week with no promises according to the staff there. The queues were too long to ask at Poplar and Sydenham. Agree with Doug the staff at Kingsland were most helpful and the same applies to the Gentleman at Muswell Hill today. Today 22nd, Harpenden had MA12 (2nd class) in RH machine and MA13 in LH machine. Staff are VERY helpful there too, especially Karim. Just got back from Birmingham, B17. No machines installed there as of today (24th March) but there is signage on the wall indicating where they will be going. Visited Aldwych and Trafalgar Square today and asked staff about NCRs. Aldwych - later this year possibly Autumn. Trafalgar Square - possibly September. 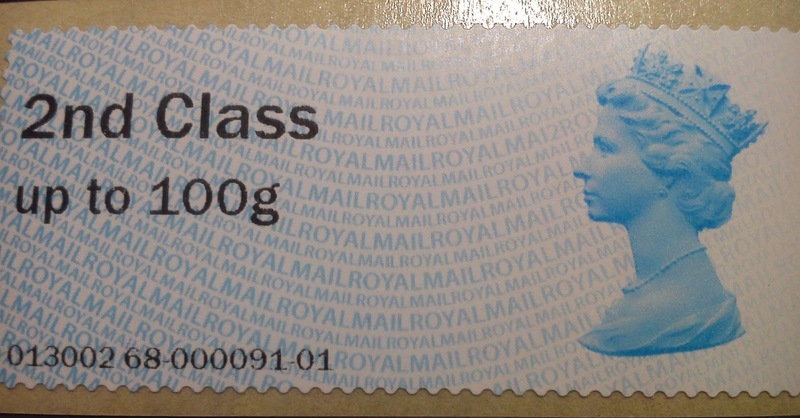 Also Royal Mail Series 2 unit A001 went live today at about 12.47. First session printed was 14 as a test. First customer session was 15. Re A002 and Gibbons - this is just a rumour. Gibbons staff no nothing on the kiosk but have been asked on a number of occasions. Visited Muswell Hill just after lunch (26th) and oh dear!! Just as I was approaching I noticed the queue was 'out of the door'. Could this be another new issue and the Post & Go machines being hit with dealers? No, no need to worry. Neither Post & Go machines were working once I got inside. The queue was just for normal counter services. So much for reliability - they didn't last long did they?!! The machines are working fine, they just have a staffing (shortage) issue at that branch. My visit to Muswell Hill - One machine had an 'out of order message on it', the other had an error code being displayed. 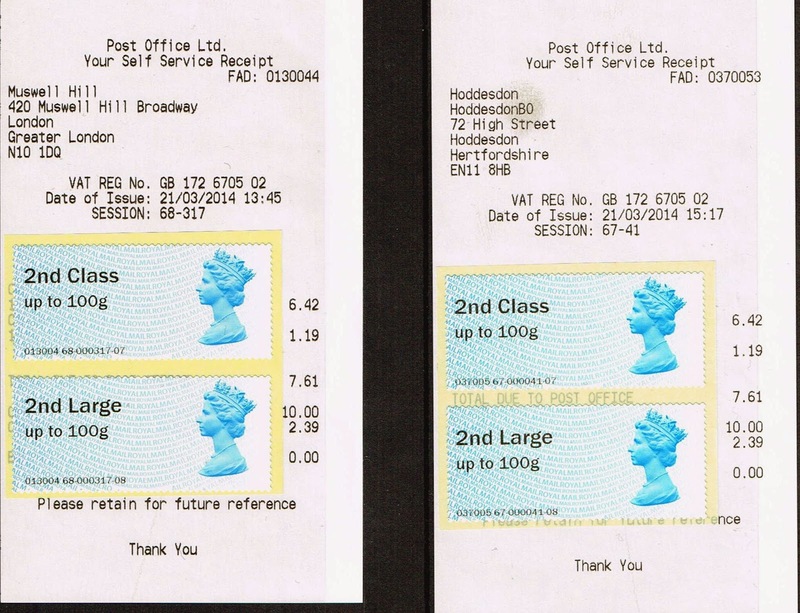 - machines certainly not 'working fine' otherwise they would have dispensed stamps! Harborne, Birmingham are now up and running. Two machines installed, both dispensing MA12 2nd class and MA13 Machins on the other reel. Machine 67 (left hand one) 2nd class Year=12; Machine 68 (right hand one) 2nd class Year=13. Just a thought but looking at the list above, why would Plymouth be receiving new machines? It would seem eminently more sensible for the rollout programme to equip those offices currently without any facilty first and then replace the Wincors afterwards? This came from the manager that the new machines will be arriving mid April. Eastcheap 5 NCR 67-71. MA13 in all printers. NCR machines are expected at Dartford Kent next week. Haywards Heath Wincor machines have been removed but there is no word on when NCR might arrive. City of London Eastcheap Post Office went live on Monday 7th April with five NCR self service machines. The machines are numbered the usual 67 and 68 plus 69, 70 and 71. Both the 1st and 2nd class stock in all machines was MA13. There was an NCR trainer present today helping both staff and customers and he told me that Dartford was going live on Wednesday the 9th April. NCR has moved north of the border, with the first machines reported from Dundee. Worthing Crown Office has 2. Durham has 2 machines that went live on Friday 2nd May. Numbers 67 & 68 both containing 1st & 2nd class machins but was not issuing receipts. The staff said these machines did not issue receipts. Was told South Shields went live the previous day Thursday 1st May. Exmouth - expecting 2 machines in "next couple of months"
Honiton - expecting 2 machines in "next couple of months"
Info gleaned from staff today. PLYMOUTH went today: 2 (67 & 68) of 3 Machines/Kiosks working at 11.44am but only 1 at 14.30 Kiosk (68) failed.~ (69) still not working. PLYMOUTH Had Spring Flowers in on Monday 19th May Seen Stamps from Kiosk 68 others not known at this time.